Located in the Community of Castile and León. 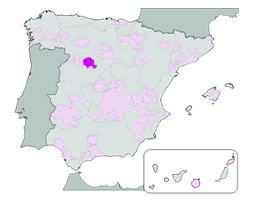 It comprises 72 municipalities, of which 53 are in the province of Valladolid, 17 are in the north of the province of Segovia, and 2 are in the north of the province of Ávila. Soil: Close to the River Duero the soils are alluvial with a high lime content. Climate: is continental (long hot summers, cold winters) with a certain Atlantic maritime influences. Temperatures vary widely and can drop below zero in winter and can reach 30°C in summer. Red: tempranillo, cabernet sauvignon, merlot and garnacha. However, the new varieties were selected according to productivity criteria rather than quality ones and for many years the wine produced was sold in bulk. White are produced using verdejo. Their color is pallid greenish, they offer thin and elegant aroma. Moreover, they are fruity and have fennel, mint and apple aspects. In the mouth they are light, fruity and fresh and they pass in the mouth they are bitter which contrasts with the mature grape, sweetness and freshness. Red are mostly produced using tempranillo and some cabernet sauvignon. Their color is pretty intense cherry, fruity, fleshy and tasty; they can remind to the Cigales red wines. Modern cold fermentation predominates in the better wineries.